Alison can arrange to come to your home for private art instruction in drawing, watercolor painting, acrylic painting and block printing. Private and semi private lessons are available for both children and adults in your own home. She builds her lesson structures based on the students particular needs and interests. They learn about the context of the practice, work on assignments to help build skill and together teacher and student dream up projects where the student creates what actually interests them. Alison moved to Incline from Southern California in 1986. She received her Bachelors of Fine Arts in 1991 and a Master in the Art of Teaching in 2006, both from Sierra Nevada College. 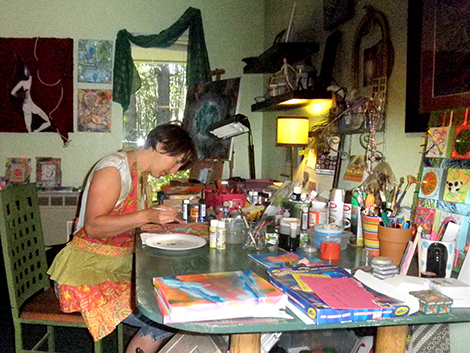 She has been an elementary art teacher for over 10 years in Incline Village community and has run a successful small business for the past 5 years. Her specialty is relief Printmaking and has developed a unique technique for hand printing on fabric which led to her online store Earth Studio Arts. She believes in using eco friendly materials when possible and is a steward of the natural environment and all that live in it.